This month you can play as a young boy trying to enjoy time off school in a strange town or a father trying to rescue his son from the effects of dark magic. Alternatively, you can try to thwart a conspiracy with its origins in history, or simply seek to survive as a young girl in a horrifying predicament. 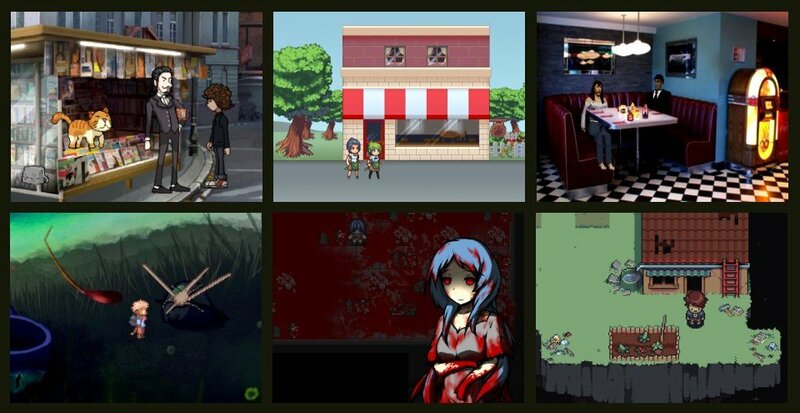 All these await you in a slight but sweet month's round-up of releases from the freeware scene. In a rural Argentinian town, the winter holidays are just about to start. However, having destroyed his report card, one young student is finding it difficult to get off the school grounds. And this is just the start of his problems, as not all is well in his local town. The nearby lake seems to have been poisoned by something (different than the usual, anyway) and some of his neighbours are acting most oddly. Perhaps Sol705, a student club dedicated to the search for extraterrestrial phenomena, can help him find the answers. With Sol705, Patoland has created a science fiction adventure in a mundane remote setting. The graphics are highly detailed, from the barbed wire-topped walls of the school to the gravelly beach at the lakeshore. The protagonist is a puffy-haired teenage slacker trying to hide his bad grades. He is not the only one with a distinctive hairstyle, as the supporting characters include a pink-streaked punk girl and a professor with white spiky locks. All are smoothly animated throughout. 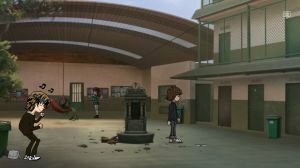 The game is also fully voiced to a decent standard, including the protagonist's smug over-achieving brother and a cranky old woman running the school tuck shop. The soundtrack is a mix of psychedelic and prog rock, fitting in with the music-obsessed youth that make up most of the cast. Mouse control is performed through simple left-click, the default cursor changing to indicate anything you can interact with. Clicking on a hotspot opens up a simple verb coin with two actions. The left one is always Look, whilst the right-hand one changes according to what you are pointing at. Clicking on the satchel in the corner of the screen opens up the inventory. Collected items can be interacted with like normal hotspots, but they can also be dragged to use on other things. Even getting out of the school takes some ingenuity, requiring you to improvise a tool to access a sealed area and take a less-than-honest approach to a shortage of cash. Once outside you’ll explore the town, with your initial quest being to find a bassist for your brother (who will tell your parents your grades if you don't). This introduces you to the strangeness of the town's inhabitants, kicking off the main story. Sol705 can be downloaded from the game’s website. A young girl named Enri wakes up in a nightmarish situation. The underground room she finds herself in is full of dismembered bodies, with blood covering the floor and running down the walls. Making her way through this slaughter to the only door, she soon discovers that she is in a sprawling complex of tunnels and rooms. But she is not the only living thing in this subterranean labyrinth, and none of the the other occupants are on her side. With nothing to her name besides the clothes she woke up in, can Enri avoid their deadly attentions, or is she destined to become just another victim? Created by Nama and translated into English by MemoriesofFear, Purgatory is not a game for the faint-hearted. Whilst moderately low-resolution with an overhead retro role-playing style, the opening room is a horrific sight, and the scenery does not get much better from there. Where not smeared in carnage, the walls appear to be plain grey breezeblocks. This uniform look is occasionally broken up by some machinery and grills, but the drab and muted tones do a lot to add to the oppressive atmosphere. The music is a slow tonal piece that also serves to set the player on edge. Some machinery generates noise, such as the rattling of industrial shutters opening. The protagonist’s footsteps also sound on different surfaces, with a particular unpleasant squelch when wading through gore. For the majority of the game, you’ll explore on your own using the cursor keys to navigate, with Z or Enter interacting with whatever hotspot you are facing. You can acquire a handful of items, mostly consisting of keys and weak melee weapons. When an interaction involves the potential use of an object in your possession, you will be offered the choice of whether to do so. The way back to the surface is blocked by a series of shutters, and you will have to search diligently for the means to open them. You will also periodically meet hazards, most notably the Butcher. It is impossible to fight, so fleeing is the only answer. 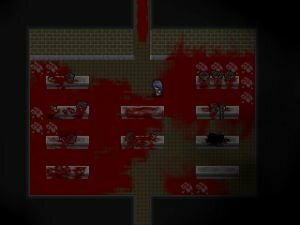 This is made more difficult by the movement speed being considerably slowed when passing through the all-too-common gore. Whilst some dexterity is required, escaping is usually more a case of using your brain to pick a sensible escape route. There are a number of places you can die, but generally these are at least partially signposted, though it is advisable to call up the menu and save regularly regardless. Choosing whether or not to solve an optional puzzle later on will determine which of the two endings you get. Purgatory can be downloaded from the RPG Maker website. Holy twisted diodes, Santa is for real!! Thank you so much for such a fantastic review Steve and all you guys at Adventure Gamers, now all my wishes has been granted! Have a great 2018! Hi guys! If you download the german version (249) for Mac, Win Linux or iOS please notice that there’s a bug when hitting the spacebar for hints. This only affected downloads from Feb 20 2018. If you’re experiencing this problem please re load the game from the web page http://www.sol705.com (saved games will remain).